In our observation and study of minority and endangered languages around the world, we have noted that one of the key issues – which largely remains unaddressed – is the low prestige given to the these languages by not just outsiders but often the language speakers themselves. This low prestige of indigenous languages which is a result of lack of support, services, opportunities and resources in these languages leads to language endangerment and death, as well as the disempowerment of the community. The primary goal of FLC Language Travels is to enhance the prestige of indigenous languages. We hope to do this – with your support and involvement – by engaging with and learning from the communities. By bringing Language Travellers to indigenous communities and talking about and learning their language(s), we aim to demonstrate to the communities that their languages are valuable resources that people are willing to spend money on. If speakers – specially the younger generation – of these local languages realise the value of their languages then, the prestige of these languages can rise and the community itself will become more engaged in maintaining, documenting, and expanding their local linguistic resources. FLC Language Travels are for those who love languages and are committed to learning about and from individuals and communities who speak minority/endangered languages. Language Travels, unlike many current forms of tourism, are not designed for people to just sightsee and eat & drink at local places. It is designed to involve the travellers in the lives, issues, desires, and knowledges of indigenous communities. Unlike many tourists and travellers, who often see locals as ‘servants’, ‘cleaners’, ‘potential thieves’, FLC Language Travels sees them as our friends who have something to teach us. Things, encoded in their languages and cultures, that we may not have thought of or considered. Proceeds from FLC Language Travels will be used to support local communities and their initiatives to maintain and empower their languages. We will strive to use indigenous businesses and enterprises in organising our Language Travels and will share all profits with the local communities. 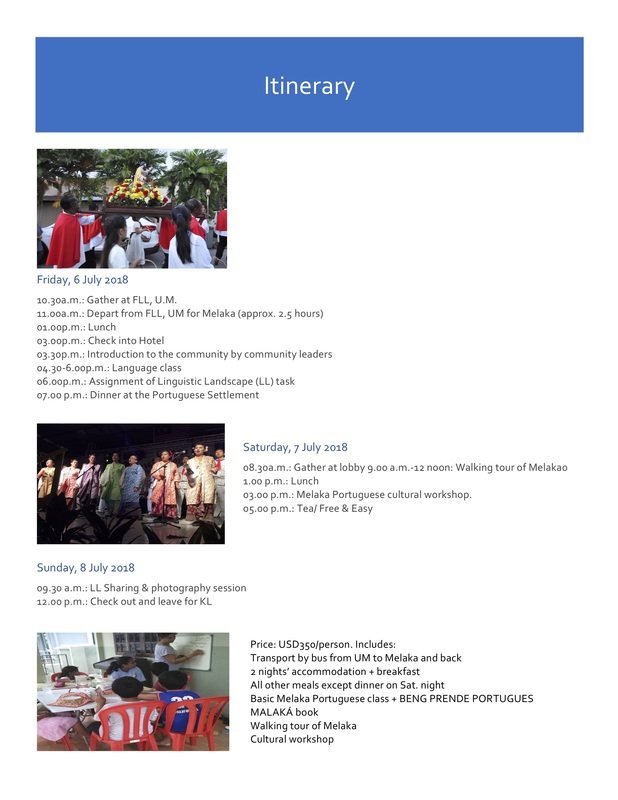 To join us on our Language Travels to Melaka, please register here. Download FLC Language Travels flyer.